1PG scholar/CSE, Tagore Institute of Engineering and Technology, Salem, India. 2Associate Professor/CSE, Tagore Institute of Engineering and Technology, Salem, India. 3Professor/ECE, United Institute of Technology, Coimbatore, India. Mobile computing is one of the most advanced computing models used in scientific research applications. Although the foundation of the proximity estimation model was laid by past generations only the recently advances opened on expanding proximity estimation application range and its research implementation. Existing approaches used such as GPS and WIFI triangulation are more complicated to find the accurate extraction of proximate location and it insufficient to meet the requirements of flexibility and accuracy. In nowadays the Bluetooth which is commonly available on most modern Smartphone's. And it finds the exact location of any Bluetooth users only in a certain limit. By pairing the key in their mobile of one Bluetooth users to any another Bluetooth users. This paper proposes a proximity estimation model to identify the distance based on the RSSI values of Bluetooth and light Sensor data in different environments. And also state Bluetooth proximity estimation model on Android with respect to accuracy and power consumption with a several real world scenarios. Prakasam P, Rajasekar R, Prakasam P. "Bluetooth to Bluetooth RSSI estimation Using Smart Phones." 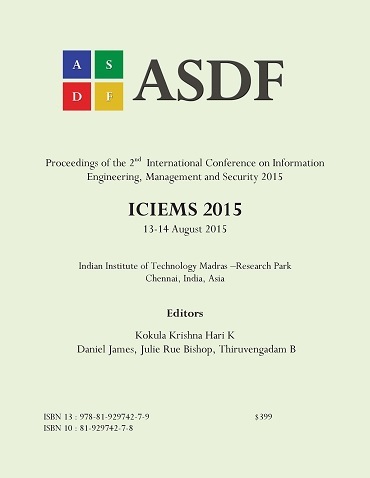 International Conference on Information Engineering, Management and Security (2015): 92-97. Print.